Audacious Ignatius was featured on the Sorta Awesome Show this week! In the latest episode, I spoke with host Meg Tietz all about the creative journey of illustrating Audacious Ignatius. Hope you enjoy it! The episode and show notes are available here, and Sorta Awesome is available in every podcast app, and from Spotify, Pandora, and Stitcher. Today, we officially launch Audacious Ignatius. It is a joy to share this book with you. Thank you for being part of our journey. 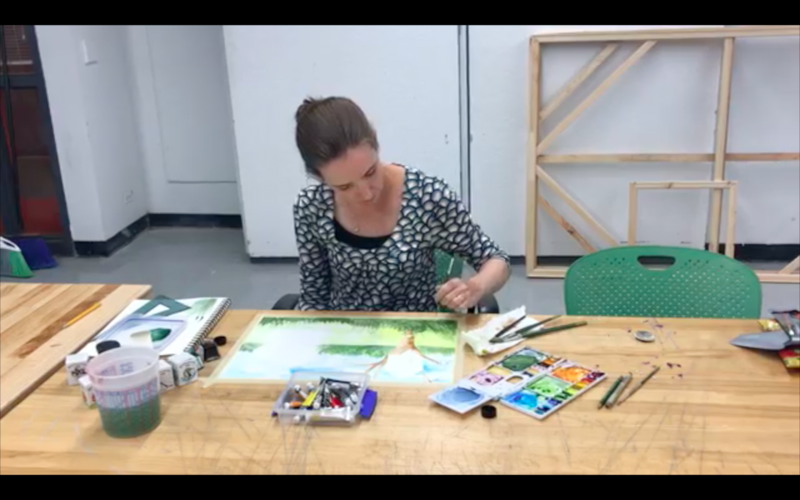 In this short video, we offer a glimpse into the making of the book in this short video. Enjoy! As parents and teachers, Paul and I think a lot about how to best communicate the message of Audacious Ignatius with kids of all ages. We have created some educational resources to give you an opportunity for further discussion of the book. Great to use at home or in a classroom! The Examen handprint activity is a way to begin praying the examen with your child. I was recently asked to do an Audacious Ignatius event for a group of 2 and 3 year olds. I wanted to read them the book, and also do an activity that would allow them to create something related to St. Ignatius’s story. How could I introduce an element of Ignatian spirituality to children so young? I thought of the examen, a traditional Jesuit prayer where we review our day with God. My young kids and I often “talk about our day” before they go to bed, recognizing the blessings of the day, and it is very much like an examen. I thought it would be a fun challenge to take the next step and make an activity to help children and parents (like us!) pray the examen together. My friend Molly made it with her 2 and 4 year old sons, and now they ask to do the “plate prayer” every night! Her 4 year old particularly likes the numbered steps, and enjoys counting which step they’re on. Cut these colorful cards apart and use them to play any of the following games, or make up your own! Sequence game: Put the cards in order of how the events happened in the book. Talk about what is happening in each picture. Search game: For younger children, you hide one copy of each card around the room, and keep the other copies in your hand. Your child can do a treasure hunt for the cards, matching them to the cards in your hand. Matching game: Put the cards face down on the table and take turns finding cards that match. It’s no secret that Audacious Ignatius will build your vocabulary! If you want to spend some time learning some new words that rhyme with Ignatius, this activity will help you make a vocabulary booklet. Kids can read the words and definitions, and draw a picture of what the word means. This has been our most requested resource from teachers! In The Religious Potential of the Child, Sophia Cavaletti says that our job isn’t so much to teach children to pray, as it is to create the environment where prayer can arise in them. I hope that these activities can help you create an environment conducive to prayer for your family or classroom, and to having conversations about God that are enriching for you and the children in your life!